The adage is actually ‘the moral of the story’ of an old Aesop Fable. One day a Fox fell into a deep well and could find no means of escape. A Goat, overcome with thirst, came to the same well, and seeing the Fox, inquired if the water was good. Concealing his sad plight under a merry guise, the fox indulged in a lavish praise of the water, saying it was excellent beyond measure, and encouraging him to descend. The Goat readily assented and the Fox leaped upon his back. Steadying himself with the Goat’s horns, he safely reached the mouth of the well and made off as fast as he could. As the story of The Fox and the Goat reveals, we often ‘take a leap of faith’ without first taking a good long look at exactly what it is we are jumping into. We put our faith in so many things — and that is usually what gets us into precarious and perplexing situations that frequently lead us down a path we have no business taking. Then we find ourselves confused, puzzled, and lost — wondering how in the heck we got into such a mess in the first place. When we place our faith and trust in people and the way of the world, we often do so with little-to-no regard for our welfare or the welfare of those around us. We end up getting hurt and inadvertently hurting those around us as well. Then we wonder why we didn’t use the good sense that God gave us in the first place. We (regrettably) failed to seriously consider what we were placing our faith in, prior to taking the leap. Why does this happen? In all truth, it is because we are constantly pursuing pleasure. We look for love, approval, and acceptance in all the wrong places. We don’t want to be left behind or left out, so we do things we know we really shouldn’t be doing. We do this because we have become convinced in our own mind that we need to do or have something in order to feel good and/or to fit in with those we believe have something we desire. So we “take a leap of faith” thinking it will be good for us. 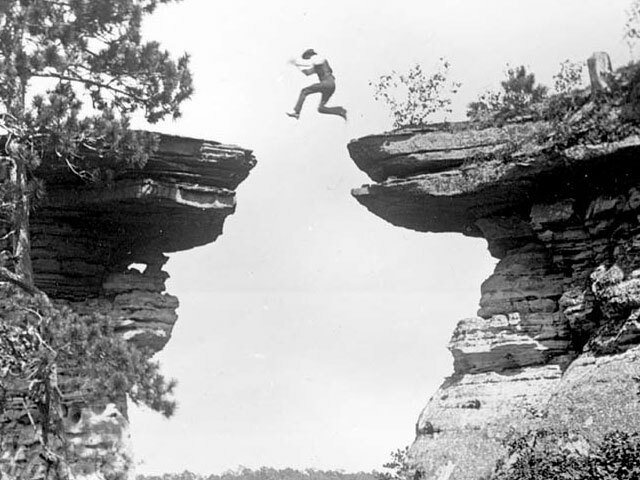 Usually, we discover that our ‘leap of faith’ has taken us ‘from the frying pan and into the fire’ and that what we put our faith in was not “as advertised”. We are surprised to find that there was a hidden cost that we were not ready, willing or able to pay. Often times that unmentioned cost is indentured servitude to that which we thought held so much promise. Worst of all, we are unable to break the chains that binds us, and we feel we have no choice but to go on to the bitter end, burdened with a heavy heart full of sorrow and regret. Take heart, dear friend. All is not lost. As long as you are breathing and you realize that you messed up and need God more than anything else in the world, you’re in a good place. In fact, you are in the best place you could ever be in your life! You see, we all have needs and desires. When we come to realize that our greatest need is our need for God, we have come to the greatest realization that any one of us can have. Then when our greatest desire becomes our desire for God — and lines up with our greatest need — we enter into the most important relationship of our life; our relationship with OUR FATHER IN HEAVEN. We come to know what it is to be loved in a way that we always desired, but never thought possible. We enter into a way of life that exceeds our wildest imaginations. We realize we had been deceived into believing that the only point and purpose to life was in what we could possess. We thought earthly treasures were of great value. Now we realize how worthless and temporary all that we longed for — and struggled so desperately to obtain and hold on to — was nothing more than a mirage; an illusion devoid of true meaning and lasting value. The only leap of faith any one of us should take, is into the arms of Jesus. Put all your faith in him and him only. Trust in God and not in mankind. Draw near to God and he will draw near to you. Open your heart to the love and guidance of God. But know and understand this — in so doing your life will not become trouble free! Life is full of trouble as it is, but when you put your life into God’s hands, people will hate you for doing so and will do everything they can to draw you away (cf. Matthew 10:16-31). But know this, you are secure in the hands of God! Be strong in your faith. Realize that there is more to life than simply getting through each day as comfortably as possible. (cf. Romans 12:1-2) God promises eternal life with him for those who endure to the end. So be of good faith knowing that suffering now – in this life – is exactly what we have been called to do. To suffer as Christ has suffered. (cf. 2 Timothy 3:12) Do not focus on your troubles. Keep your focus on Christ and the promises of God. There is great reward awaiting those who endure hardships now. (cf. Hebrews 12:1-3) Open your Bible and learn all that God has promised to those who love him and live in reverent obedience to him. Do not waver, for a person with divided loyalty is as unsettled as a wave of the sea that is blown and tossed by the wind. Such people should not expect to receive anything from the Lord. Their loyalty is divided between God and the world, and they are unstable in everything they do. Believers who are poor have something to boast about, for God has honored them. And those who are rich should boast that God has humbled them. They will fade away like a little flower in the field. The hot sun rises and the grass withers; the little flower droops and falls, and its beauty fades away. In the same way, the rich will fade away with all of their achievements. God blesses those who patiently endure testing and temptation. Afterward they will receive the crown of life that God has promised to those who love him. And remember, when you are being tempted, do not say, “God is tempting me.” God is never tempted to do wrong, and he never tempts anyone else. Temptation comes from our own desires, which entice us and drag us away. These desires give birth to sinful actions.And when sin is allowed to grow, it gives birth to death. So don’t be misled, my dear brothers and sisters. Whatever is good and perfect comes down to us from God our Father, who created all the lights in the heavens. He never changes or casts a shifting shadow. He chose to give birth to us by giving us his true word. And we, out of all creation, became his prized possession.